Moving back into a small space with only a few items took a toll on our youngest. 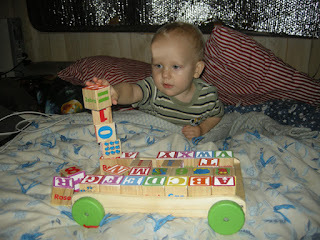 Oh, he was excited to be back into the motorhome, but he was keenly aware that he didn't have any toys that were HIS. The other kids had brought a few things along, but he had mostly played with the grandparent's toys during our stay there and we knew that there would be toys in California. Still, in the meantime, the other kids had toys that were THEIRS, and he didn't have anything to share, or not, at his discretion. So in light of that, and of course the holidays, we set off to find something special for Philip, who is 21 months. 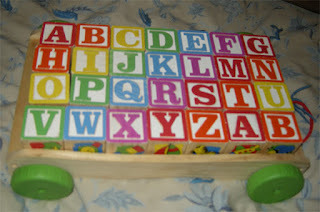 We went to Wal-mart, of all places, and picked out a Wooden Pull Along Learning Blocks Wagon . You know, I've reviewed some big ticket items on this blog, but this simple toy has really impressed me and I'm excited to tell you about it. 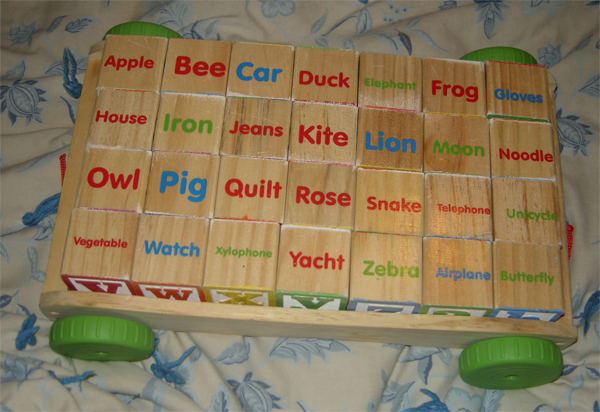 We've had other alphabet blocks before, but none with so many features packed into them. So let's dive in and talk about what you can do with them! First off, the wagon they come in has been a lot of fun. The wagon-wheels are fairly solid plastic and the kids have loved using it for their regular toys when they get the chance. 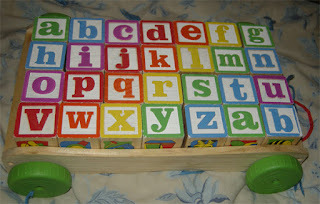 First of all, there's the ABCs. Notice that they are the colors of the rainbow and there's this pretty pattern going on. Learning the letters is awesome. On the opposite side, using complimentary colors (red-green, orange-blue, and yellow-purple), are the lower case letters. This is awesome for learning the difference between capital and lower case letters. Putting them in order is a self-correcting activity because the color pattern will only be correct if they put they use the same kinds of letters. This activity has been great for Ruth (3). Then there's the special feature that really sets these blocks apart. They have WORDS! They're like wonderful, concrete flash cards. Check that out! 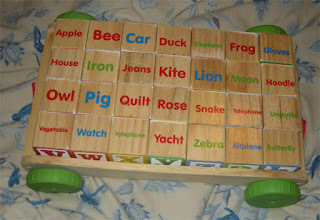 That was actually the selling feature that made me choose these blocks over a stacking toy we could have bought him. Each letter has a word on it. As you may have noticed, A and B repeat themselves, but there are new words for the second A and B blocks. Read the word correctly and be rewarded by seeing a full-color picture. These pictures have been fun to use for memory work with the older kids too. Put 5-10 pictures in a random order, tell a funny story using them all in sequence, cover the pictures and have them tell you the order. Then let them practice and come up with their own stories. Last but not least, there are numbers. 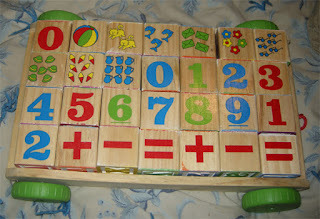 Each numeral is used twice, after which we have addition, subtraction and equal signs, two of each. 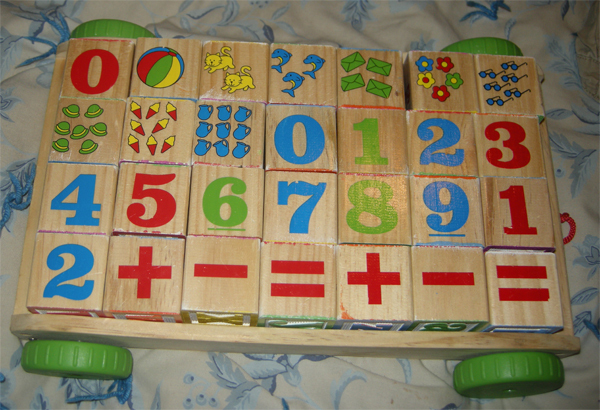 On one side of the block is the numeral, say, 5, and on the other are 5 objects that begin with that block's letter. I turned over the numerals on a few of these to give you an idea. Zero just has another zero on the other side. The numerals/numbers have been very useful for all of my kids. Philip gets exposure, Ruth practices counting and reading numbers. She can count to 100, but she likes to say "zero" after numbers ending with zero, ie, fifty-nine, sixty-zero. Sixty-one... Anyway, these blocks have been great practice for her. I am also making very simple equations for her. 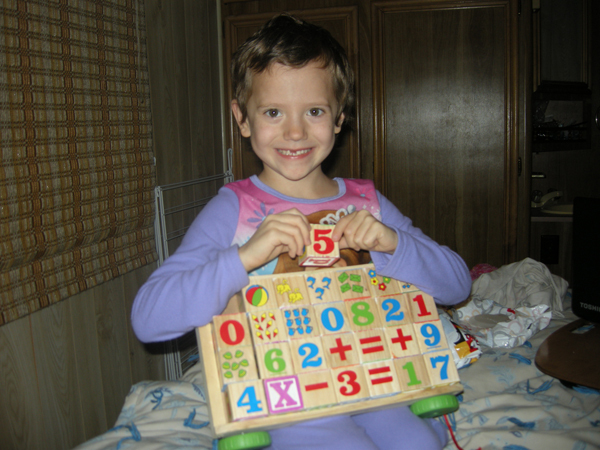 While Patrick and Peter have had a little bit of block play-time, Helen (6) has really been very fond of using baby blocks to do HER level of math. She makes equations for me to solve and then I make equations for her. We usually have to do this during Philip's naptime, of course, but it has been a lot of fun. She especially likes to do simple algebra with the X block- that's the only way we have been able to do division and multiplication with these blocks, but it works. Baby toys can only go so far, after all. 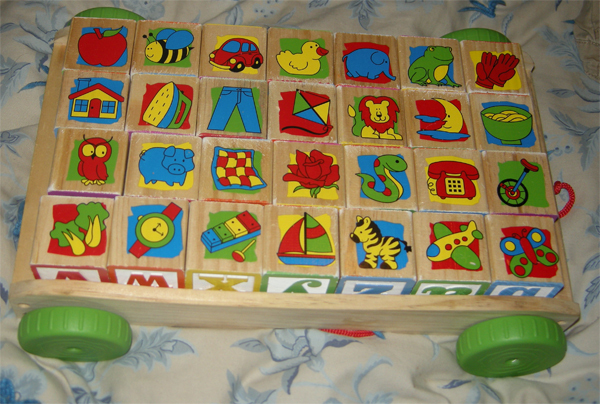 But seriously, these blocks have been as good of a manipulative for math as they have been the language arts. After all of these uses, Philip has come up with his own ingenious activity for these blocks. While he loves to look at the pictures and identify them, he also loves to, well, you know, stack them. Yep, they make great hand-eye-coordination tools as they learn to balance and make proper structures. 28 is enough to make some interesting shapes. 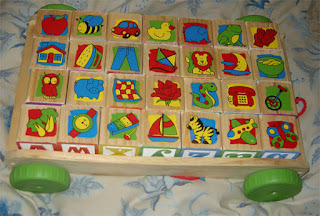 Overall this block set has been an incredibly fun and educational toy for our early-learning family. 5 stars! I highly recommend her work. She was well read, highly educated, and her love for early childhood education make her a relevant model for this blog. That is baby as he manifests himself at first. The newly born infant must adjust himself, so to speak, to the conditions of existence. Heart, lungs, food system, brain,-- must all become accustomed to their proper exercise. Air and food, warmth and sleep, will adequately cherish the physical life, and the vital functions are soon established. but Somebody, a person, man in embryo. The true mother discerns that he has other than bodily needs; and from his first drawing of breath, if she begin no farther back, by faith in that of which there is no sign, by mother instinct, she addresses herself to the delicate task of supplying spiritual nourishment. What is as yet unmanifested by the child must be nurtured in the child. She also wrote the lyrics to this song from the "Mother Play" collection. But we especially love her finger plays. Our hands have become little people, cats chasing mice, baby chickens hatching, growing plants, bridges, water mills, and so many other things. Get to know her, get to know her work, and she will be your friend too! Many things have happened for our family lately- moving to California, moving into an RV, and now, in our effort to be location independent, I have been hard at work on my music website. Here are some of the free printables I have posted recently. Glissando is a board game based on Parcheesi. Solfege Fingers is a singing game. Music Berries is a board game with many different uses. White background also available. Solfege Hopscotch Game is a singing game played with coins and your voice. I have also purchased some video making software and learned in part how to use it. I'm excited about how this tool will help me make build more materials in the future. I made this Major Key Signature tutorial with full-sized printables. I've also been making videos to accompany the Mother Play project I did a few years ago, making recordings from Froebel's original Kindergarten music. But of all of the projects I've done, I am most excited about my new membership site. I've been wanting to build one for a long time, but it was cost prohibitive. The technology and software became available to me about a week ago, and I jumped for it. members.teaching-children-music.com is now live. 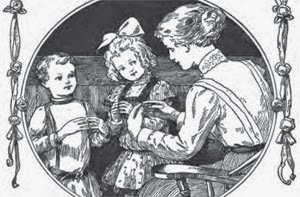 All of the Mother Play videos I've made are on the site, as well as all of the materials from The Solfege Train and Beginning Rhythm, and I have great plans for this website. No longer do I have to wait until a large project is completed before releasing my work, I can add materials as I make them. Please consider joining. :) Better yet, once you are a member, you can join the affiliate program and make a 40% commission on any sales you refer. Membership access is only $30 per 6-month period. My goal is to provide deep value to many people at as an affordable price as I can and still earn a fair wage for my work, as my entrepreneurial Dad has taught me by example. I really hope I will be able to build a successful business that can support our family and allow me to make materials full-time. The more members, the more time I will be able to devote to the site.